There has been a recent upsurge in interest in Harlequin Appaloosa alpacas, and there are many good reasons why. The most obvious one is that they are fun to look at -- Harlequins and Appaloosas never fail to catch the eye in a herd. There is another reason, however, a more practical one that speaks to the true purpose of the alpaca: their fiber. True Appaloosa alpacas often exhibit fiber of a most exquisite, elite quality, as they not infrequently emerge unexpectedly from elite breeding lines. In turn, the related Harlequin Appaloosas may possess grey fiber that is dramatically more advanced than that of the average Classic Tuxedo Grey. Furthermore, it is a common goal of many grey alpaca breeders to produce a grey blanket that is as uniform as possible. Paradoxical as it may seem, we believe that the Harlequin Appaloosa gene is the key to producing this spotless, uniform elite grey fiber, with little to no color variation even between fibers. While we also love our Tuxedo Greys at Howling Hill Farm, our primary focus is on the Harlequin Appaloosas for this reason. On top of this, the extreme variability in expression of the Harlequin Appaloosa gene means that every cria is different, and every breeding a fun surprise. While we hope to eventually narrow down the variables involved in the expression of the various distinct types of Harlequin Appaloosas, for now, the roulette wheel that these animals represent is all part of the fun. What is a Harlequin Appaloosa Alpaca? 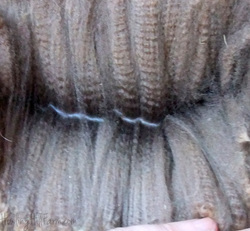 The 2015 AOA Show System Handbook defines an appaloosa alpaca as one whose "blanket fiber exhibits six or more spots of distinct (easily identified by the naked eye) secondary color(s) of which the primary color is not grey." This is not the definition that we are using at Howling Hill Farm. This definition includes alpacas that are not Harlequin Appaloosas, the most notable of which is the Speckled Pinto. It also excludes the entire category of Harlequin alpacas, which are base grey. 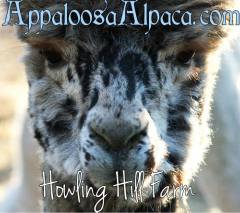 The Howling Hill Farm definition of a Harlequin Appaloosa alpaca is: "Any alpaca whose color phenotype is the direct result of the expression of the the Harlequin Appaloosa genotype." We have chosen to refer to the proper name of this gene as "Harlequin Appaloosa" in order to encompass both distinct phenotypes -- the True Appaloosa and Harlequin Grey -- in all of their various manifestations that result from its expression. What Isn't a Harlequin Appaloosa Alpaca? Because we are using the term Harlequin Appaloosa to refer to a specific gene -- not a show classification -- a Harlequin Appaloosa is more than just an alpaca with a certain number of spots. Any spotted alpaca who does not express the Harlequin Appaloosa gene is not a Harlequin Appaloosa alpaca, even though it may be classed as an appaloosa according to the AOA Show System. We make this distinction not to be persnickety, but for the very practical reason that our program is primarily focused on grey fiber, and spotted alpacas that are not Harlequin Appaloosas are highly unlikely to produce any form of grey. Confused? Have a look at our primer on Harlequin Appaloosa genetics, then take a peek at the various types of harlequin appaloosas that are out there.